Musicologists and music-lovers alike have attempted to both qualify and quantify the term “GROOVE” as an ‘unspecifiable but ordered sense of something that is sustained in a distinctive, regular and attractive way, working to draw the listener in.’ In simpler words, a groove usually refers to a rhythmic drive that somehow compels the body to move…whether it be a toe-tappin’, swingin’ venture, or a full-blown rump-shakin’ jaunt, the Groovemeisters aim to please! Although “MEISTER” has etymological roots from the German meaning “master,” it simply refers a person skilled or prominent in a specified area of activity…in this case groovin’! Presenting both a combination of innovative and original compositions, as well as, sophisticated and fresh interpretations of well-loved standards, Mike Cadó and The Groovemeisters successfully covers much musical ground. Guitarmeister Mike Cadó, Organmeister Gordon Sheard, Bassmeister Ross MacIntyre, and Drummeister Davide DiRenzo comprise the tight-knit musical unit, exuding an infectious energy that guarantees to thrill any audience. 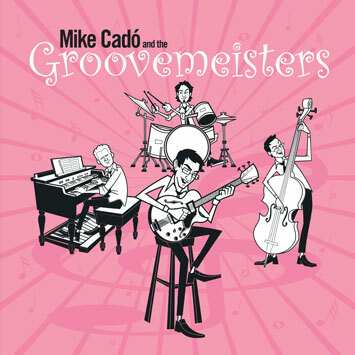 Finally, if you wish to wisely ignore the aforementioned mumbo-jumbo…plainly put, Mike Cadó and The Groovemeisters deliver a groovin’, swingin’, happenin’, and all-round good time for all!